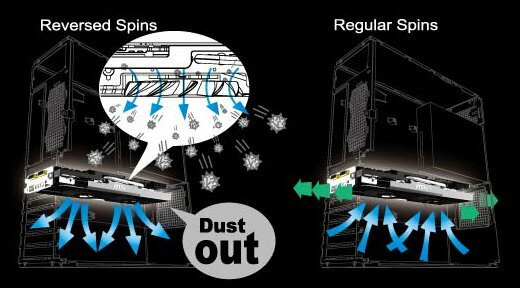 MSI presents Dust Removal Technology, a technique that promises to reduce dust buildup on graphics card coolers by running the fan in reserve at full speed for 30 seconds after system starts. Computers can become very dusty after prolonged periods of use, especially in public spaces. Even the average home PC may have its cooling performance degraded by excessive dust buildup, severely crippling performance due to overheating. This year, leading international motherboard and graphics card maker MSI has released its exclusive Dust Removal technology. With this technology every time the computer starts up the cooling fan on the graphics card will run in reverse at full speed for 30 seconds. The powerful reverse airflow removes dust clinging to the heat sink fins and fan blades, ensuring optimal cooling performance from the graphics card every time! The fully automatic dust removal technology is an innovative feature exclusive to MSI’s graphics card. By purchasing MSI products equipped with Dust Removal technology, gamers avoid dust-related overheating and the inconvenience of having to regularly clean their graphics cards. Dust can build up inside the case after a computer has been in use for a long time. Experiments show that cold air can't effectively remove the heat from the heat sink fans on a graphics card if they are covered with dust. The result is reduced cooling performance and the GPU's working temperature may even increase by 15°C 1! Excessive GPU temperatures force the fan to run at a higher rate, produce more noise and may even cause crashes due to overheating. Extended run times at high temperature will also reduce the working life of a graphics card. The new Dust Removal technology available exclusively from MSI this year features an innovative graphics card fan design that runs in reverse at full speed for 30 seconds whenever the system starts up. The powerful reverse airflow removes dust clinging to the heat sink before reverting to normal operations after 30 seconds. Dust removal is a completely automated dust removal technology. No additional drivers or hardware are necessary! This unique technology slows the rate of dust buildup to ensure optimal cooling performance of graphics cards. Purchasing an MSI graphics card equipped with Dust Removal technology means gamers no longer have to worry about dust build up.